The Government of the Punjab promulgated the University of Veterinary & Animal Sciences, Lahore Ordinance 2002 and upgraded the former College of Veterinary Science, Lahore (established in 1882) as University of Veterinary and Animal Sciences, Lahore (UVAS) w.e.f. 8th June, 2002. 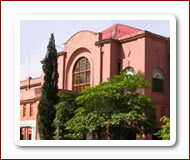 The UVAS, Lahore is one of the oldest institutions in the Asia. It is catering provincial and national needs for trained and qualified manpower in the fields of veterinary, management, environmental, ecological, poultry, Dairy Production & Technology, zoological, human nutritional, pharmaceutical sciences. Institute of Livestock Services training Centre, Sheikhupura. Barani Livestock Production Research Institute, Kherimurat, District Attock. Govt. Livestock Paravet School, Horoonabad, District Bahawalnagar. Kings College of Health Sciences, Sahiwal. Allama Iqbal Institute of Life Sciences. Near Govt. Boys High School, Narowal. Operated By Training Pakistan Pvt. Ltd. In terms of Paragraph 32 of the University of Veterinary & Animal Sciences (UVAS) Lahore Ordinance 2002, this University has jurisdiction to affiliate other training and academic institutions subject to the fulfillment of codal formalities.